Some links will open in a new window. If you want to relax and calm your soul while exploring beautiful seascapes, Nova Scotia is the place to be. Canada's ocean playground is surrounded by four bodies of water, with a coastline that stretches as far as the eye can see, and a seafaring heritage that goes back to the days of the early explorers. Don't miss out on the opportunity to see some of the most beautiful and historic attractions Canada has to offer. The Scenic Travelway System consists of ten coastline highways which allow you to see everything from the legendary Fortress of Louisbourg to the many picture-perfect fishing villages which line the Atlantic shores. Wherever your travels take you, you are sure to be welcomed by a friendly smile which makes Nova Scotia a one of a kind tourist paradise! The Halifax/Dartmouth Metropolitan Area is the business, cultural and educational Centre of the Maritimes. The city surrounds the second-largest natural harbour in the world, Halifax Harbour, second only to Sydney, Australia. On the go, day and night, the harbourfront bustles with activity. Visit Pubs, shops, museums, parks and universities. Take scenic walks through the gorgeous Point Pleasant Park and Public Gardens. Indulge in Halifax's History by taking guided tours through the Halifax Citadel and the Shubenacadie Canal. Galleries, concerts, theatre, fine dining all await you in beautiful Halifax. Halifax is accessible through various means of transportation including: train, bus, highway, ferry and plane. There is a shuttle bus service to and from the airport which makes stops at all the major hotels in the Halifax area. Dalhousie University is located in the heart of Halifax. Dalhousie is an exciting international learning community, devoted to the discovery and dissemination of knowledge. The beauty of Dalhousie's architectural style dominates the campus. There's no better time to witness Dalhousie's beauty than during the summer months. From May to August, we invite conference groups, large and small to, meet at Dalhousie. A wide variety of services and facilities are available to assist you in managing a successful conference. Dalhousie University, Halifax and Nova Scotia, make a great conference destination. 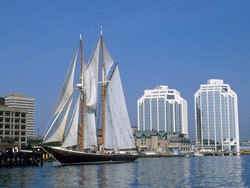 Halifax, Gateway to Atlantic Canada, has flourished as a prominent port on the world’s second largest natural harbour. Today, visitors have a choice of arriving by land, sea or air — read on for information on your choice of transportation. If you are travelling by car, the map on page 13 shows the region’s approaches. From the north and the airport, Route 102 (Bicentennial Drive) brings you into downtown Halifax via Bayers Road. Route 118 from Route 102 connects with Route 107 to the Eastern Shore and Route 111 (the Circumferential Highway circling Dartmouth). Route 111 then leads to downtown Halifax via the MacKay Bridge. Routes 3 and 103 come from Yarmouth and the South Shore. Route 101 comes from the Annapolis Valley and Yarmouth. If you’re coming from the USA, you can reach Nova Scotia by driving through New Brunswick or you can take one of the ferry services listed below. VIA Rail provides train service west to the rest of Canada, connecting with US Amtrak services in many cities. There is one train per day departing at 1:30pm every day except Tuesday. The train station is located in the south end of Halifax. For more information: 1-800-561-3952. Acadian Lines and DRL Coach Lines provide excellent service throughout the province of Nova Scotia. There are connections with SMT Eastern from the neighbouring province of New Brunswick, Voyager from Quebec and Ontario, and Greyhound from the United States.